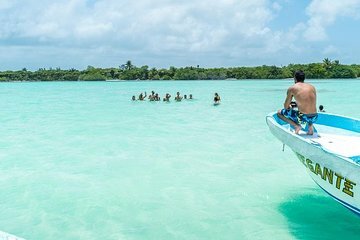 Go way off the beaten path on a full-day adventure into Sian Ka'an, a UNESCO Biosphere Reserve with mangroves, coral reefs, and thriving marine wildlife. You'll hop into a truck for the bumpy ride through the reserve, then continue by boat on a marine safari, watching for crocodiles, dolphins, sea turtles, manatees, and more. Get a closer look by snorkeling the Sian Ka'an reef, and follow the road all the way until it ends in the far-flung fishing village of Punta Allen. WONDERFUL GUIDE, drivers, AWESOME local boat captains! LOCATION BEAUTIFUL. But DO NOT BOOK THIS TRIP due to road conditions! CANCEL it if you have already booked. Why? The hard gravel road to get to Punta Allen is deep potholes for about 35 miles. It is dangerous for your spinal/back health to ride this long in the BACK of a truck with no shocks. Just ask your doctor if you doubt me! It is like riding in a wheel barrow over speed bumps rather fast for 35 miles, each way. 2-3 hours each way. It could ruin your whole vacation with pain, or cause long-term damage. SOLUTION: This trip is basically to a beautiful mangrove area. Take a Viator tour to a mangrove area that is closer to Tulum or not far off hardtop, or in a van with shock absorbers.although this could take 3 hours each way IF you go to Punta Allen. VIATOR SHOULD CHANGE THIS TRIP DUE TO BAD ROAD CONDITIONS. The excellent guide warned us beforehand the road was bad, but the problem is that HARD banging your spine for hours and hours in the back of a truck is truly a risk. Excellent tour, Robert the guide went above and beyond!